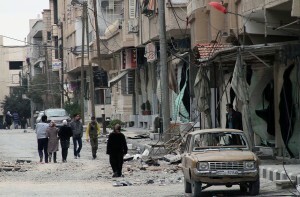 More than 150,000 have died during Syria’s ongoing civil war, a Britain-based monitor group said Tuesday. Relying on a network of sources on the ground, the Syrian Observatory for Human Rights said that 150,344 people, including 51,212 civilians, have died in the three-year war since March 2011; adding that the actual toll was probably closer to 220,000. The United Nations announced in January that its officials would stop reporting the Syrian death toll because it was difficult to maintain accurate statistics, despite using different sources including several NGOs and the Syrian government. The UN’s last estimates, released in July 2013, put the death toll at more than 100,000. As the Syrian conflict enters its fourth year, peace talks between President Bashar Assad’s government and the opposition have achieved little progress in Geneva. On March 24, UN peace mediator for Syria, Lakhdar Brahimi, said it was “unlikely at the current time” that peace talks would resume.